In the event that the Apple Watch battery needs to be replaced, Apple technicians will be able to swap the component out, although the company hasn't elaborated on how the replacement process will be handled. The information was shared by a spokesman with TechCrunch, who suggested that Watch owners will likely need to send their device to Apple to have the battery swapped for a fee. The Apple Watch isn't designed to be opened easily or accept conventional watch batteries. Instead, it uses a rechargeable battery topped off through an inductive charger. The company has been touting "18-hour all-day battery life" for the product. This is however based on a "mixed usage" scenario with a 38 mm model, as Apple states in its marketing, comprising "90 time checks, 90 notifications, 45 minutes of app use, and a 30-minute workout with music playback from Apple Watch via Bluetooth over the course of 18 hours." 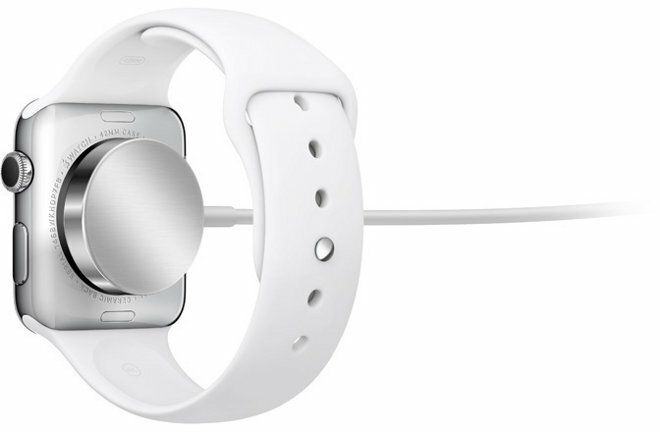 A 42 mm Watch "typically experiences longer battery life," Apple remarks. In practice, some functions can also consume considerably more power if they're used for long, such as workout tracking or music playback. Phone calls in particular are a massive drain, such that doing nothing but taking a phone call will shrink battery life to three hours. A faulty battery could potentially become a serious issue. More details about the Apple Watch should arrive as the April 24 launch date approaches.